Stan Trollip is our resident apologist for the art of Africa here on MIE. I am horning in on his turf here. I hope he won’t mind. The Kingdom of Benin, founded in 1440, was a pre-colonial African state in what is now Nigeria. Works of art from Benin now grace museums all over the world, notably in London and Brooklyn. They are made from cast bronze, carved ivory, and coral. They were originally produced as ritual objects and believed to have sacred power. The divine ruler of Benin, the Oba, used the objects to honor his ancestors and to make contact with the deities. His first act on ascending to the throne was to create, in his courtyard, an altar to his father. He commissioned the craftsman of the kingdom to create works to adorn that altar and to be used throughout the year to mark important milestones, such as to bless the first buds of yam plants, to celebrate past victories, or to honor the Oba’s ancestors. Typical decoration of the objects included images of the Oba and his court officials in coral regalia: crowns, aprons, necklaces, and bracelets. The Oba’s sobriquet was “leopard of the house.” The King kept domesticated leopards in his palace. Imagine the impression made on the common people by their king, who not only lived with the fearsome, cunning cats but had them at his command. 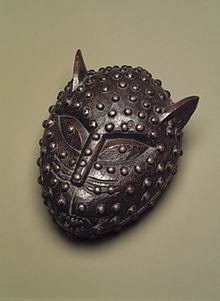 Images of leopards abound in Benin art objects. 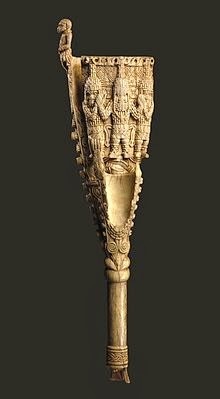 When Portuguese traders and missionaries arrived in 1400’s, the making of art in Benin entered a new age, and some say a golden age. The Portuguese did not come as conquerors but as business partners—their soldiers protected the kingdom from its enemies, and they brought in European artistic motifs and luxury products, such as mirrors and tableware. Many Portuguese loan words wound up in the local languages. Among the valuable trade items that the Portuguese took from West Africa were gold and slaves. In the 19th century the British entered the picture, with their joint efforts at suppression of the slave trade and of empire building. 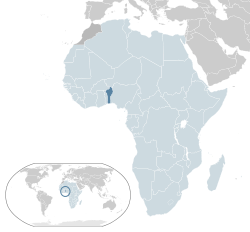 The Bight of Benin was declared a British Protectorate in 1852. When all but two members of the Brit’s first expeditionary force were killed, the English sent in the big guns. In 1897, 1200 arrived under the command of Admiral Sir Henry Rawson. 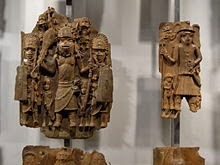 They razed the city of Benin, massacred many of its inhabitants, and wiped out its community of artisans. They rationalized their operation by declaring—some think speciously—that the local savages included human sacrifice in their worship rituals. And rightly by declaring that the British presence in West Africa would stop the exportation of slaves. I leave it to you to decide who were the real barbarians? Yeah, and the next thing you'll be expecting us to believe is that the British looted the Parthenon of its marbles under a specious grant of authority from the occupying Turks to protect them from the heathen Greeks. Jeff, I visited those looted items earlier this year on my way to Crimefest. I was pleased to find that they are no longer labeled as The Elgin Marbles, as they were the first time I saw them in the 70's--as if Lord Elgin had conceived of them and sculpted the marble with his own fingers. AT LEAST, now they are called The Parthenon Friezes. It's not justice, but it's a start. Imagine if the French sent back everything that was looted by Napoleon--from Italy and Egypt. I, too, have often wondered who have been the barbarians in Africa. And I have long ago answered that question for myself. The question I have is" Has anything changed?" The blatant racism of both Orientals and Caucasians, in general, knows few bounds. Stan, I had a typical European-centric education, but something turned in my heart when--still a student--I saw the 1962 film "Mutiny on the Bounty." The disciplined, self-confident superior officers of the Bounty were appalled by the warm, inviting social habits of the "natives." About half way through the movie, I realized that, in the worldwide historical clashes between "native" cultures and the Europeans, the wrong side had won, and humanity had lost. What I have learned in the fifty intervening years has only confirmed that realization. Barbarism knows all colors, all religions, all sexes. Barbarism is within all societies. The Europeans were merely the 'lucky' first to achieve technological and economic superiority over most others, in modern times, and were thus able to more fully exhibit their barbarism over a wider area. But thoughtful examination shows that the races of Africa have had long-running inter-tribal warfare, as well as the peoples of "Native Americans," the Mongolians, the Japanese, the Chinese... on and on, each and all have shown the appalling ability to use pride, fear, greed, hatred and any other tool that comes to hand as a means to wage barbaric acts on their neighbors, near or far. We humans ARE barbaric. Everett, you are so right. We may have hit upon the reason so many people love mystery novels--they show both sides of humanity in bold relief. 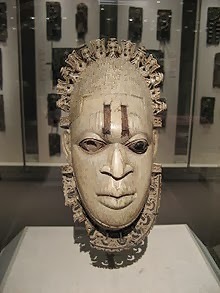 The society that created these beautiful works of art also shipped off their fellow Africans into slavery--as only one concrete example of the tribal enmities that predate the arrival of Europeans. 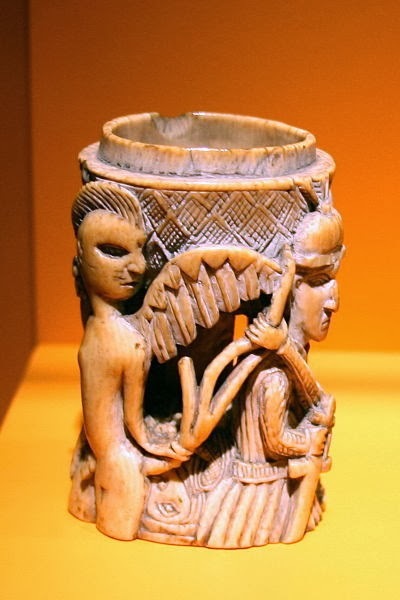 The citizens of Benin traded people for luxury goods. This prompts me to consider the role of greed for luxury goods and cheap labor in the human history of planet. There is a book in that theme. I wish I had a clone of myself to put to work on it.